A broken kneecap, also known as a patellar fracture, is when the small bone at the front of your knee breaks. The patella acts as a shield for your knee joint, making it vulnerable to fracture if you fall directly on it or hit your knee against the dashboard in a car accident. Some simple kneecap breaks can easily be treated with a cast or splint until the bone heals. 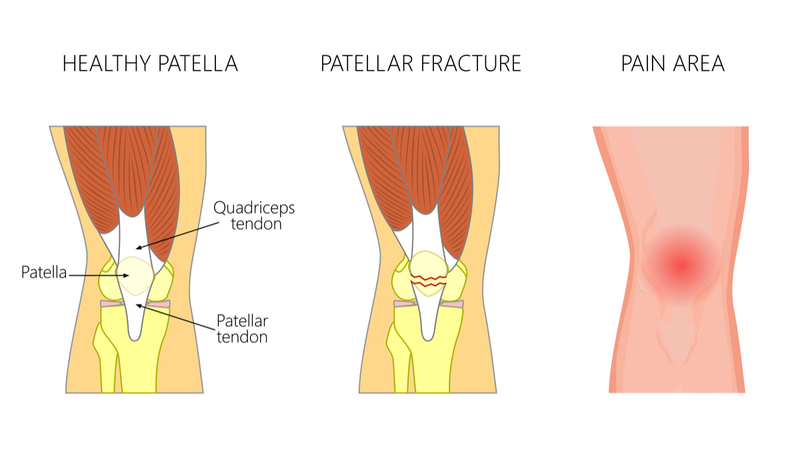 However, most patellar fractures are more complex, and if the bone moves out of place, surgery is needed to stabilize the kneecap so it heals properly. Most fractures hurt moderately for a few days up to a couple of weeks. Using ice, elevating the affected leg, and taking over-the-counter pain relievers are often enough to relieve some discomfort. In the event of severe pain, your doctor may prescribe a stronger medication like an opioid for a short period of time. Keep in mind though that although opioid medications help relieve pain after surgery, dependency and overdose has become a top public health issue. It is important to use opioids only as directed by your doctor, and to stop taking them as soon as your pain begins to improve. Whether your recovery involves surgery or not, rehabilitation will play an important role in getting you back to your regular activities. Recovering from a patellar fracture can require keeping the affected leg immobilized for an extended period of time, which can result in a stiff feeling and muscle atrophy. Most people will return to their normal activities within three to six months, though those with severe injuries may require longer to heal. Your doctor may suggest making changes to your daily routine to prevent re-injury. Things like deep knee bending, squatting, and even climbing stairs may need to be avoided to prevent future issues. As always at Orthopaedic Associates of St. Augustine, we’re proud to play a role in helping people regain mobility and get back into the action without pain. If you’ve experienced a patellar fracture or another type of orthopaedic injury, please request an appointment online or give us a call at 904-825-0540. Board Certifications in Orthopaedic Surgery and Sports Medicine. Dr. Grimes specializes in sports medicine and reconstruction of the shoulder, hip and knee.